For most people who struggle with substance abuse, quitting “cold turkey” is not just unrealistic — it can also be dangerous. When you stop using a drug, you lose your previously built-up tolerance. This is why overdose often occurs during attempts to recover. Intense physical withdrawal symptoms can complicate recovery, making relapse difficult (if not impossible) to avoid. A medically assisted detox reduces the risk of relapse and overdose by placing the detoxification process in the hands of a professional. During a medical detox, a doctor assesses your unique medical needs. He or she will then develop a plan to safely reduce, and eventually eliminate, your physical dependence. Below are common approaches to medically assisted detoxification and tips to find the right treatment for yourself or a loved one. What does a medical detox involve? A medical detox may take place with inpatient or outpatient treatment. The key to success is a comprehensive recovery plan with dedicated support. Some detox plans involve replacement therapy, or the gradual replacement of an illicit drug, such as heroin, with a less harmful substitute like methadone. A key component of nearly all medical detox programs is a gradual, carefully monitored reduction of drug use that mitigates physical withdrawal symptoms and reduces the risk of accidental overdose. When is a medical detox required? Between the risks of reduced tolerance during abstinence and intense withdrawal symptoms, opioids such as heroin and fentanyl are particularly dangerous to overcome without medical assistance. Withdrawal symptoms, which may begin within 6 to 12 hours of the last dose, may include which include vomiting, sweating, fatigue, muscle aches, shakiness, anxiety, hallucinations and intense cravings. These symptoms can last up to a week, and for many, can feel unbearable. Medically assisted detox provides a safe environment that mitigates the pain and discomfort of withdrawal through replacement therapy and a carefully supervised reduction in administration of opioids. The ease of obtaining alcohol and social pressures make alcohol a difficult drug to overcome without help. For alcoholics, quitting suddenly can also cause withdrawal symptoms, including nausea, vomiting, shakiness, sweating, irritability and loss of appetite. Medically assisted detox can help those who struggle with alcohol abuse to safely restore their physical health before taking the next steps toward long-term recovery. Benzodiazepines, such as Xanax and Valium, also require a medically assisted detox to avoid dangerous withdrawal symptoms such as hallucinations, seizures, heart palpitations, psychosis and increased risk of suicide. Symptoms can last for months after last use. Medically assisted detox can mitigate symptoms by first transitioning from short-acting benzodiazepines to longer-acting drugs, before helping clients gradually reduce their dosage. Detox is a first crucial step toward recovery, but it is only the beginning of long-term recovery. 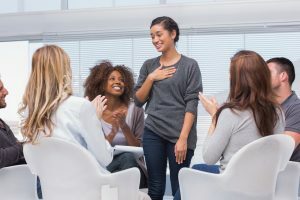 The most successful treatment programs also involve psychological treatment as needed, behavioral therapy, and comprehensive aftercare to make the transition from treatment to life in sobriety a smooth one. Cognitive Behavioral Therapy, a core treatment modality at Sprout, focuses on providing clients with specific, actionable strategies to manage stress and challenge negative thinking. CBT is also common for treatment of mental illnesses, personality disorders, depression and/or anxiety that may co-occur with drug addiction. A support system is incredibly important to an individual’s recovery from drug or alcohol addiction, particularly during the transition from treatment to a new life in sobriety. BSFT maintains that the family remains the most influential social system in the development of each member of the family. This therapy looks at a client’s behavioral, emotional and cognitive issues within the larger context of the family. The approach also presupposes that family dynamics influence risky behavior such as substance abuse. The goal of BFST is therefore to identify these issues in order to improve and strengthen family relationships, which play a vital role in post-treatment recovery. If you or someone you love suffers from addiction, call us today to learn how to get the help you need to safely overcome withdrawal symptoms and avoid relapse. Our experienced, supportive clinicians understand the challenges of breaking free from addiction and are committed to providing the right treatment for you through every phase of recovery, including aftercare. A long-term view is an important part of aftercare. This includes undoing bad lifestyle habits that may have formed during addiction and introducing healthy ones, including exercise, meditation and healthy eating. Inpatient rehabilitation provides around-the-clock clinical and psychological support, allowing a person suffering from addiction to focus on recovery by removing the distractions of day-to-day life.